With speculation mounting as to his future, Athlone Town manager Aaron Callaghan looked on from the side-lines as his team were again soundly beaten. 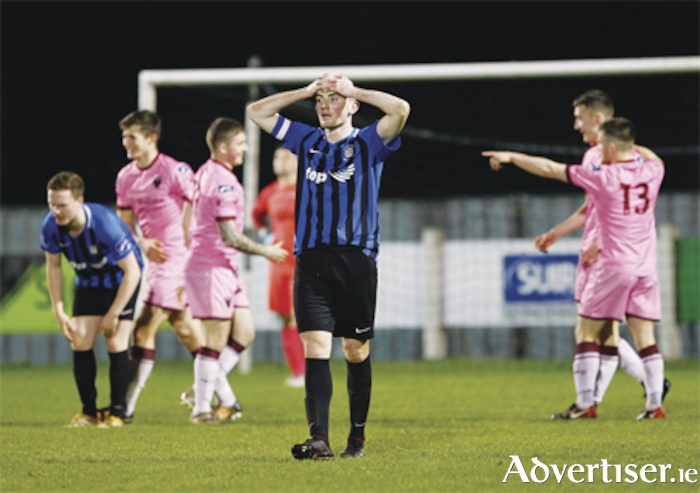 Wexford FC created club history with their biggest ever win as they ran in seven goals without reply at Ferrycarrig Park last Friday night (April 21 ). A two match ban saw Callaghan banished from the bench, but the view from afar cannot have been any better than that facing his assistant Terry Butler. There was just a goal between the teams at the half time break, but a complete collapse by The Town in the second half saw Wexford run riot. Shane Barnes became the third player to score a hat-trick against Athlone this season. Aaron Dobbs and substitute Dean George doubled up to complete the demolition. Ryan Gaffey made his first start in 2018 in one of four changes to the side beaten by Cobh. Both teams had struggled to find the net this season with just 10 goals scored between them in total. Wexford should have opened the scoring from their first attack, but Barnes scooped the ball over from close range. Gaffey fired over from Athlone's first chance, while a Shane Stokes free from the right flew just wide of the far post. A first corner kick fell Athlone's way after 16 minutes. George Mukete and Gaffey were both off target with further Town chances. The home team broke the deadlock on 39 minutes. Dobbs got past centre half Ger Smith to fire to the net from 12 yards out. Wexford forced a late corner and Barnes then ended the action with a blocked shot, leaving the bare minimum between the teams at the break. The second half was a disaster for Athlone as they conceded six times, including three goals in a five minute spell late on. The turning point came after 53 minutes when the home side doubled their lead. Cormac Raftery appeared to be pushed by Dobbs, who was allowed to send in a cross from the right. Barnes was on hand to score from the edge of the penalty area. Athlone never recovered from this setback. Just after the hour mark, Barnes made it three, while Jake O’Connor then had a chance to reduce the deficit but fired wide from the right. Barnes completed his quick fire hat-trick after 66 minutes before being substituted. His replacement Dean George was soon among the goals to make it five. During a disastrous four minute spell for the visitors, Wexford hit the record books. Raftery took down Dobbs and the victim fired the resulting spot kick past Michael Fogarty. The rout was completed after 79 minutes when George fired to the net from 10 yards. George had a further chance to also complete his hat-trick but saw his goal bound effort blocked by the keeper. Substitute Ollie Hamzat had a late chance to grab a consolation score, but scuffed his shot with only the goalkeeper to beat.